It's no secret that I love independent shops and designers, I've written before about the importance of supporting these businesses and I think it's becoming increasingly important to so do. If you are Bristol based you may have come across Objets De Desir in their pop up location in Cabots Circus (top floor next to Starbucks). If you haven't, I really urge you to visit, the shop itself has such a welcoming feel to it and is so refreshing to find such creative and individual items nesting almost the high street stores! It's very easy to loose track of time whilst browsing their beautiful products and every time I visit there is always something new to 'ooh and ahh over'. Objets De Desir is ran by the lovely Rachel Drake and features amazing artists such as Lizzie Pearce, Little Birdy Crafts and Alice Shields amongst many more (including me! ;)). 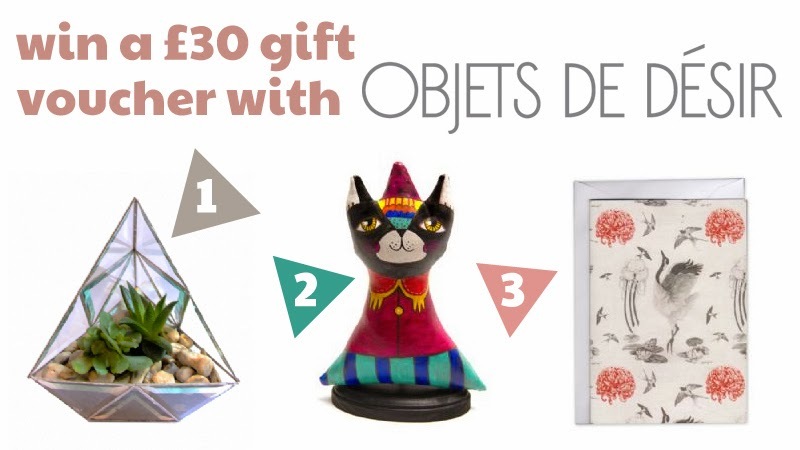 Rachel has been kind enough to offer a £30 gift voucher for the Objets De Desir online shop (meaning anyone in the UK can enter). To enter just complete any/all of the below and good luck! What a gorgeous book! Appealing to both grown ups and children! I'd put my voucher towards the Roger Tricks Sculpture Doll by Romina Berenice Canet! I think I'd get a few of the illustrated brooches to add to my collection! Kiki insists that I use part of the voucher towards this - http://www.objetsdedesir.com/wooden-lid-ceramic-jar-with-pig-design-by-pousse-pousse-citron-311-p.asp - she is piggie obsessed!! This one looks fab - any books with bright colours and textures get the thumbs up from me! We love board books even though my boy is older now. He can be quite rough with the ones he likes the most. I love all the textures on that book. And it is always good to promote fruit. Looks like a lovely book - if in doubt Eliza will always go with yellow too, I have no idea why! I love the paper sculptures. Always with the great giveaways! thanks! We, too, have this book and love it. We also have it's vegetable companion book. I have no clue where we found them (I think they were baby shower gifts) but I agree, they're lovely to look at *and feel!